As we approach Discovery's Shark Week, here are a couple of interesting shark items that have been traveling the Internet. First, a study by chemists from the University of Duisburg-Essen found that the teeth of mako sharks and tiger sharks contain the mineral fluoroapatite (fluorinated calcium phosphate). Humans' and other mammals' teeth contain an inorganic, bone-like compound, hydroxyapatite. as we all known from or fluoride toothpaste, mouthwash, and water, there is an advantage to having some fluoride protecting our chompers. 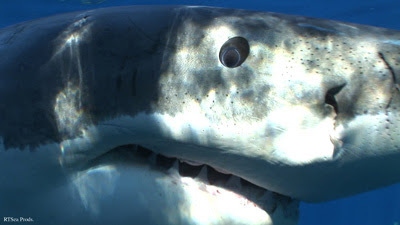 So, sharks have built-in cavity protection. And, as the professor mentioned, they replace their teeth regularly. A shark can contain as many as several hundred teeth in it's jaw at any one time, with rows of fresh new teeth ready to come to the fore as older teeth are pushed out. Which brings me to the second interesting shark item. 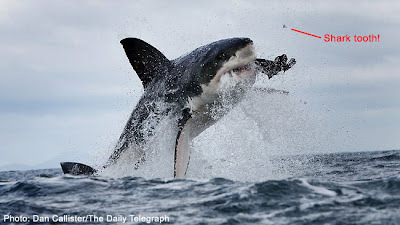 Many of you have seen images of the white sharks at Seal Beach, South Africa leaping out of the water attempting to either bite down on an unsuspecting seal - or a seal decoy placed in the water by crews hoping to grab some spectacular video or still photos. South Africa's Chris Fallows has built a respected career out of documenting white sharks going airborne with videos like the "Air Jaws" series and some amazing photographs. Australia's The Daily Telegraph ran a brief article on Seal Beach with photographer Dan Callister taking his own memorable photographs of airborne white sharks. As dramatic as his shots were, what caught my eye in several rapid-fire images of a shark grabbing a seal decoy was the clear evidence of the shark shedding a tooth. You can see it airborne in the image below. Lastly, for those of you who have ever wondered what it would be like to see a great white shark up close, but decided you had to be an experienced diver or half crazy, Kevin Richberg wrote in The Huffington Post's Travel Blogs his experiences cage diving in Australia as part of his 30 Postcards Project. What caught my attention was how he described the experience. When doing any public speaking about white sharks, I often recall the word that first came to mind when I saw my first great white shark. Serene. There is a calm majesty to these animals; not a frantic, teeth gnashing demeanor at all. And that was exactly how Richberg saw it. "What surprised me was that following the initial excitement of seeing the sharks up close, my mood turned quite quickly to being calm and peaceful. I know you're probably thinking that 'peaceful' is the last word you'd use to describe a great white shark encounter, but for me it was true."